With three or four wings (in mechanical or automatic versions), sizes Ø 2,000-3,600 mm, standard height 2,500 mm (adaptable), with central bar (without display cabinet), bearing structure of stainless steel/steel lined with aluminium profiles, with night locking option and emergency fold-away wings (either mechanical or automatic). A classic design solution combined with perfect workmanship. 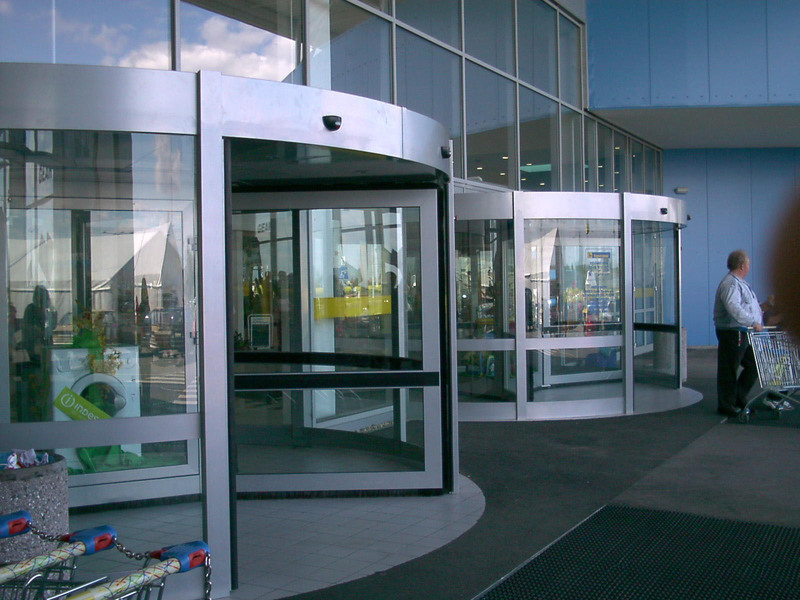 The frames of the door wings and the solid curved walls are manufactured from aluminium profiles in RAL colours. The lining of the ceiling space, in which the carousel drive is located, is at least 300 mm thick and is made of aluminium sheet as standard. The lining can also be made of stainless steel materials upon request. The glass panels for the door wings are, dependent on their size, either made of tempered safety glass (TSG) or laminated safety glass (LSG). For solid curved walls, the panels are only made of laminated safety glass (LSG). 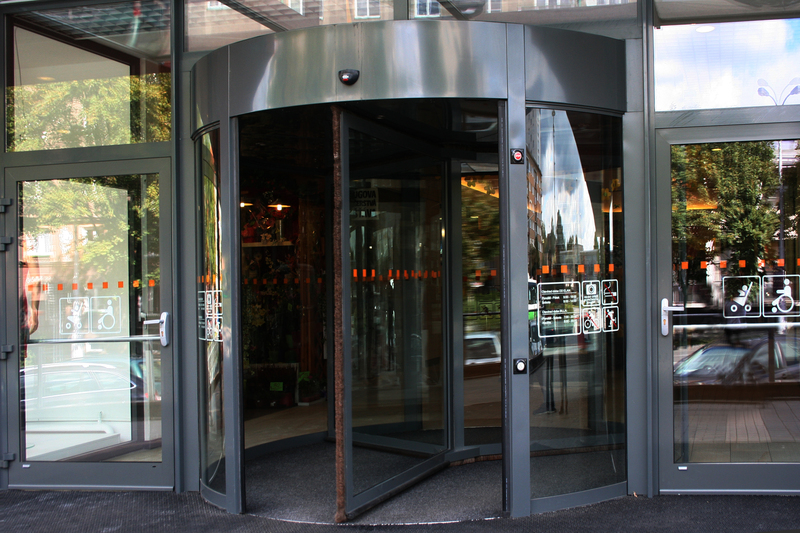 The door is equipped with a drive unit and control system manufactured by the renowned Swiss company RECORD (BLASI). The drive units, the reliability, safety and durability of which have been verified in a series of rigorous tests, use motors with a high dynamic braking force, which is an important safety feature. The sophisticated control system allows easy and trouble-free operation of the door, as well as the monitoring of all safety features. 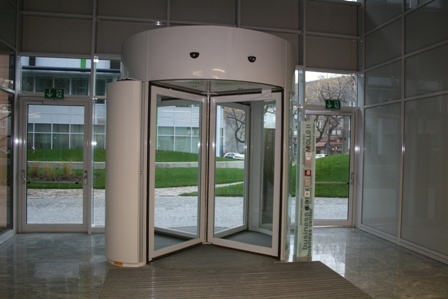 The Business carousel-type revolving door is manufactured in diameters from 2,000 to 3,600 mm and is suitable for busy entrances to office buildings, hotels, banks, etc. 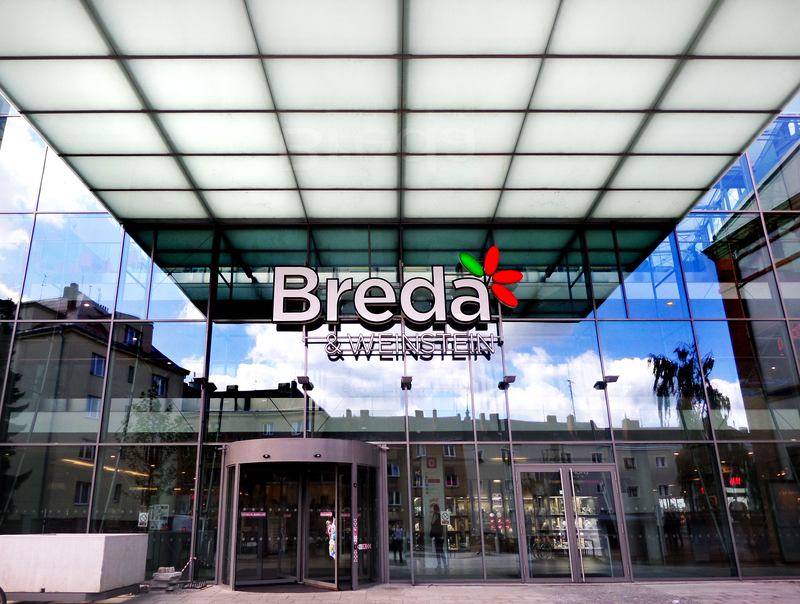 With three or four wings (in mechanical or automatic versions), sizes Ø 1,600-2,600 mm, standard height 2,500 mm (adaptable), manufactured from aluminium profiles, with night locking option and fixed wings. 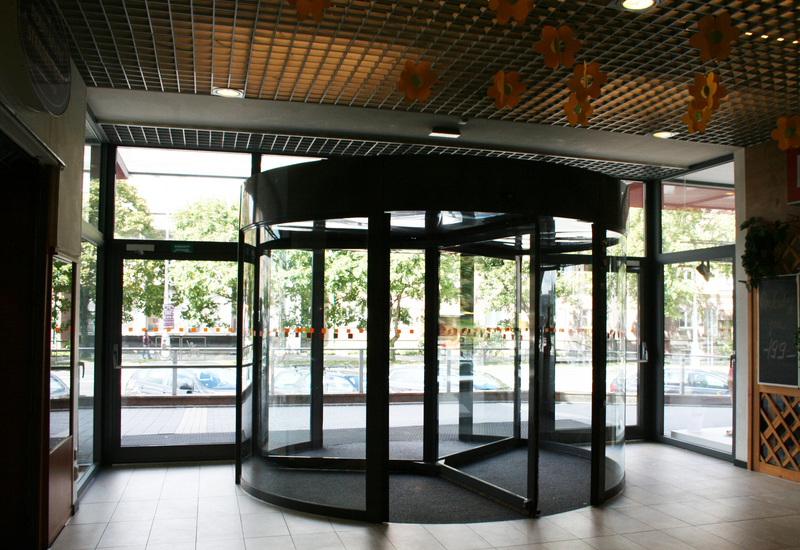 This carousel-type revolving door is both lightweight and strong. This lightness is achieved by using slender aluminium profiles for both the sealing frames of the wings and the frames of the fixed curved walls. In terms of its mechanical design, the ceiling frame is either 110 mm high, or 220 mm high if the drive is located in the ceiling. The glass panels of the door wings are, dependent on their size, either made of tempered safety glass (TSG) or laminated safety glass (LSG). For solid curved walls, the panels are only made of laminated safety glass (LSG). 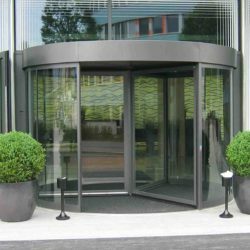 The door is equipped with a drive unit and control system manufactured by the renowned Swiss company RECORD (BLASI). The drive units, the reliability, safety and durability of which have been verified in a series of rigorous tests, use motors with a high dynamic braking force, which is an important safety feature. The sophisticated control system allows easy and trouble-free operation of the door, as well as the monitoring of all safety features. 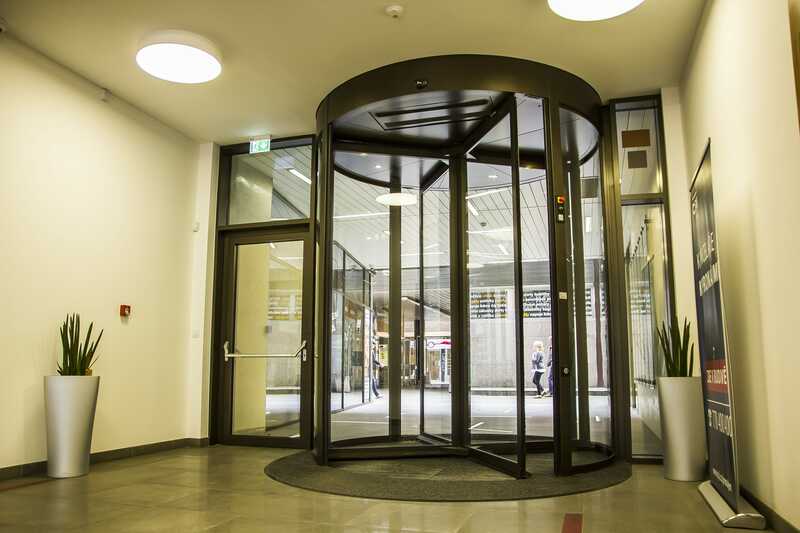 The Economic carousel-type revolving door is manufactured in diameters from 1,600 to 2,600 mm and are most often used as an entrance system for office buildings, banks, etc. With three or four wings (in mechanical or automatic versions), drive located in the floor, sizes Ø 1,600-2,600 mm (option up to 3,000 mm), standard height 2,500 mm (adaptable), all-glass design – glass roof, visible parts made of stainless steel, with fixed wings. This is a futuristic, light and transparent solution, which, as its name suggests, is almost entirely made of safety glass. 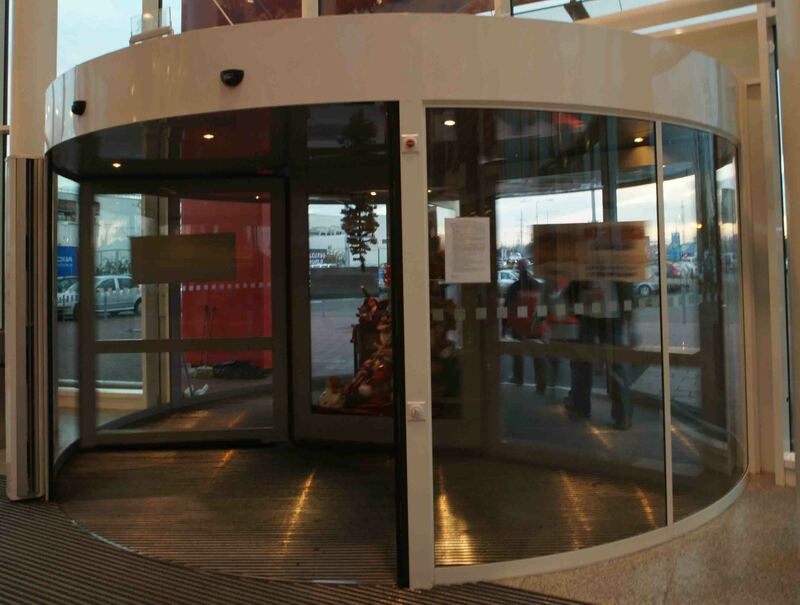 The glass panels of the door wings are made of tempered safety glass (TSG), whilst the solid curved walls have panels made of laminated safety glass (LSG). Both the door sealing frames and the frames of the solid curved walls are made of aluminium profiles, which are lined with stainless steel. The ceiling is completely made of safety glass and is framed with stainless steel profiles only 30 mm high. For the automatic version, the drive is located in the floor. 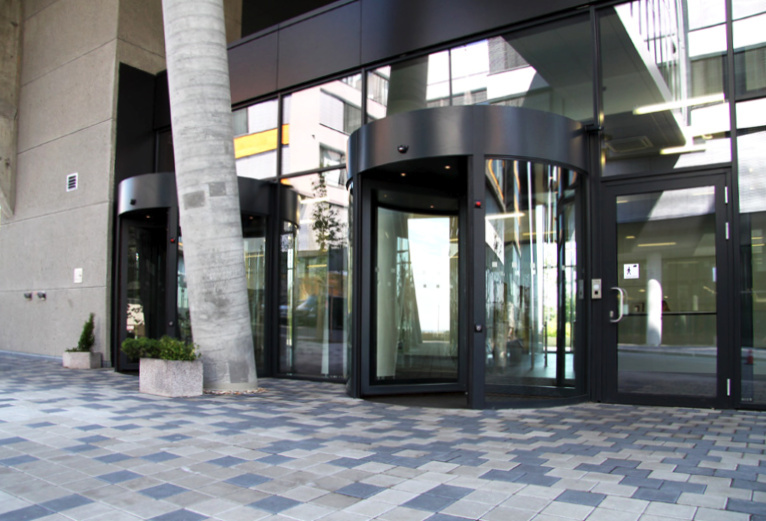 The door is equipped with a drive unit and control system manufactured by the renowned Swiss company RECORD (BLASI). The drive units, the reliability, safety and durability of which have been verified in a series of rigorous tests, use motors with a high dynamic braking force, which is an important safety feature. The sophisticated control system allows easy and trouble-free operation of the door, as well as the monitoring of all safety features. 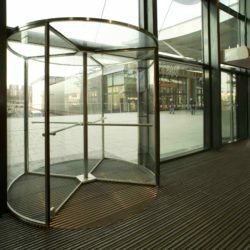 The Transparent glass carousel-type revolving door is manufactured in diameters from 1,600 to 2,600 mm (option of up to 3,000 mm). 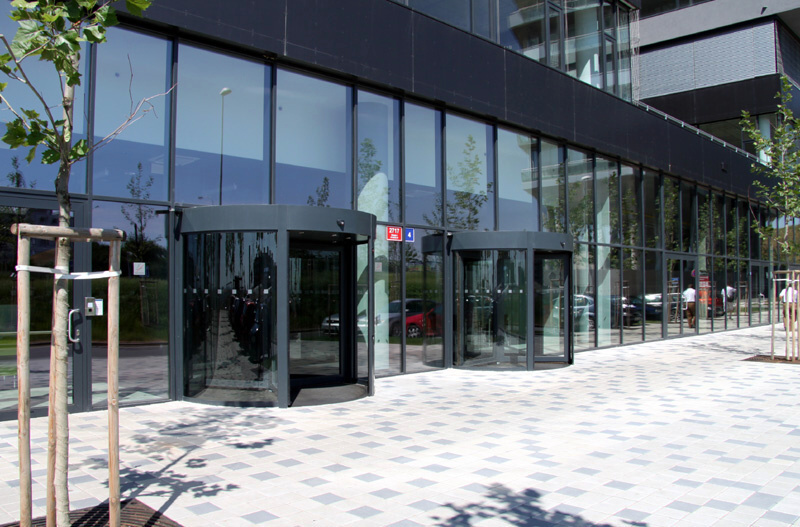 It has been specifically designed and developed as an entrance system for all-glass facades in order to create an overall transparent effect. 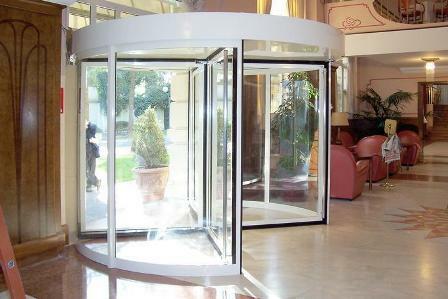 With three or four wings (only automatic versions), sizes Ø 4,200-6,000 mm, standard height 2,500 mm (adaptable), with central display cabinet, bearing structure of stainless steel/steel lined with aluminium profiles, with night locking option and emergency fold-away wings (either mechanical or automatic). A classic design solution combined with perfect workmanship. The frames of the door wings and the solid curved walls form a steel structure, which is lined with aluminium profiles in RAL colours. The lining of the ceiling space, in which the door drive is located, is between 400 and 450 mm thick depending on whether the door is equipped with automatic folding door wings. The supporting structure is, due to the diameter of the door (from 4,200 to 6,000 mm), more robust than for the CLASSIC Small (ADMIN) type. The central column is replaced with a display cabinet. The glass panels of the door wings are made, depending on their size, either of tempered safety glass (TSG) or laminated safety glass (LSG). 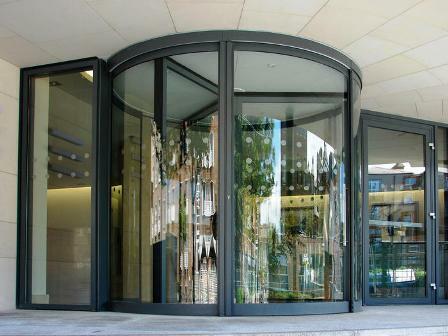 For solid curved walls, the panels are only made of laminated safety glass (LSG). 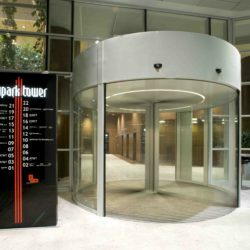 The door is equipped with a drive unit and control system manufactured by the renowned Swiss company RECORD (BLASI). The drive units, the reliability, safety and durability of which have been verified in a series of rigorous tests, use AC motors with a high dynamic braking force, which is an important safety feature. The sophisticated control system allows easy and trouble-free operation of the door, as well as the monitoring of all safety features. 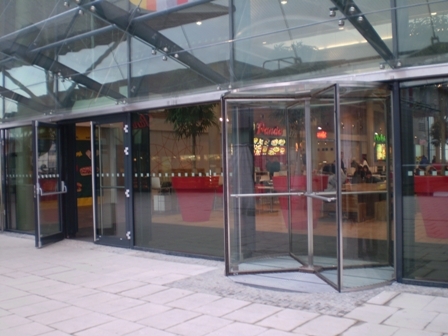 The Titan carousel-type revolving door is suitable as an entrance system for shopping malls, centres and buildings with high levels of footfall. 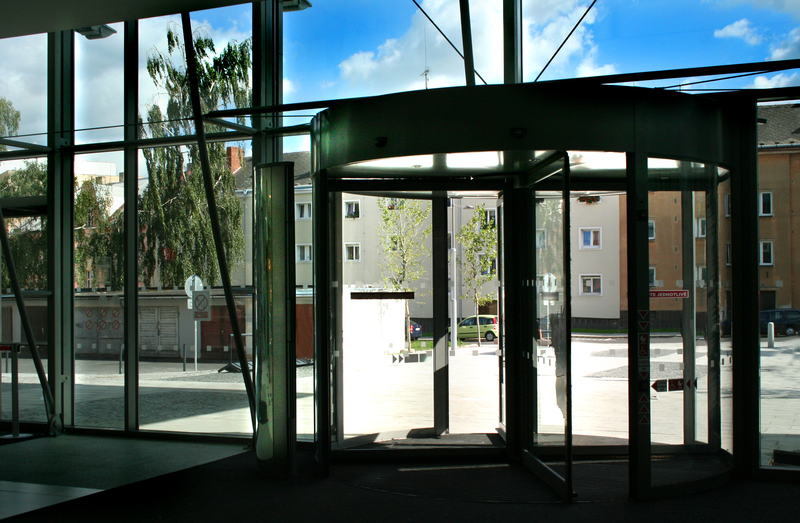 A door of the highest quality with an emphasis on people´s safety. Suitable for highly-frequented entrances. Everything revolves around safety! This is especially true for public buildings which children, people with disabilities or elderly people normally visit. 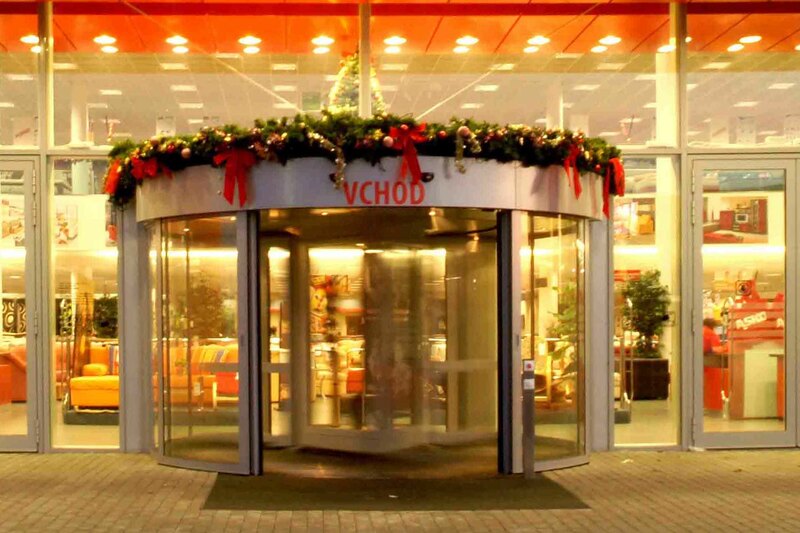 Raccoon carousel-type revolving doors are suitable for busy entrances to department stores, amusement centres, hotels, office buildings, banks, insurance companies, airports, train stations, hospitals, etc. 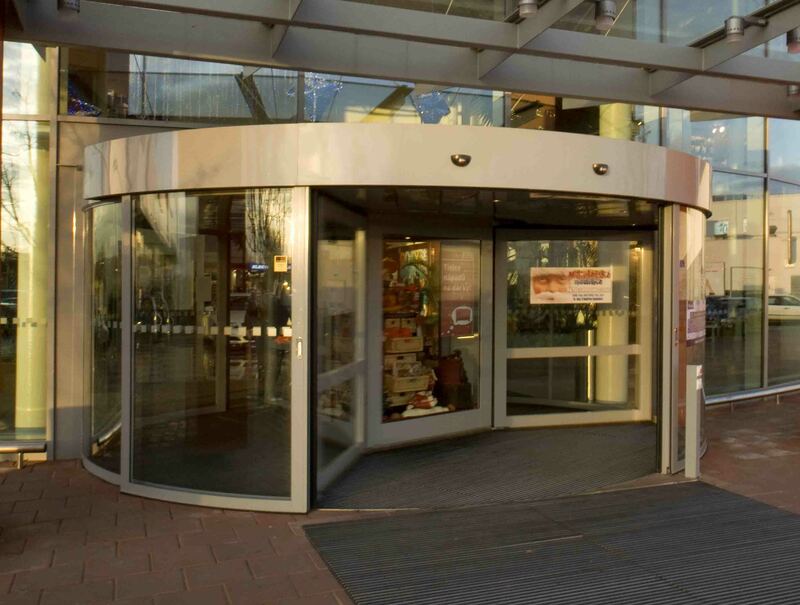 Carousel entrance doors provide more than a standard solution. 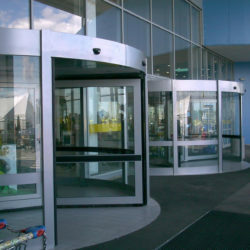 Raccoon carousel-type revolving doors contain many safety features, including adjustable speed, the option of mechanical door control, a stop-start system when a collision with a door wing looks imminent, and a powerful drive for silent and smooth operation. 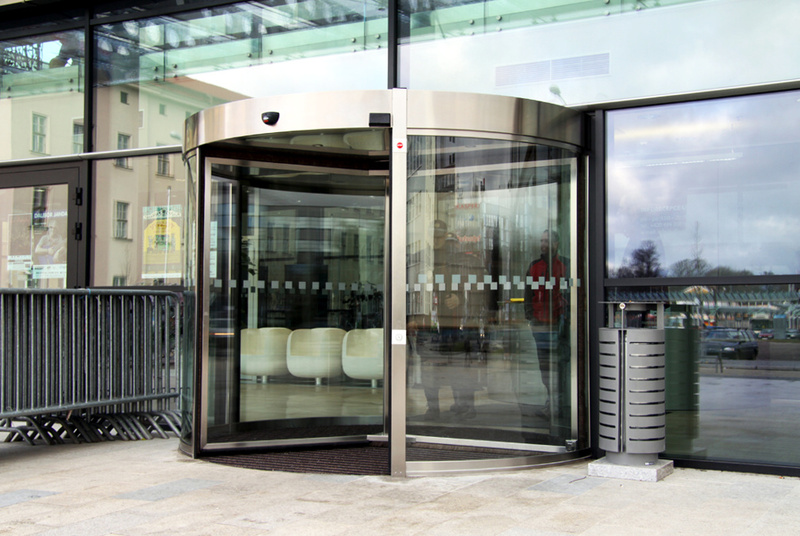 In addition to safety, Raccoon carousel-type revolving doors also meet other demanding operational criteria, such as reducing heat loss by permanently separating the indoor and outdoor environments. Conversely, during the summer months it does not reduce the efficiency of air-conditioning units of buildings. This feature also eliminates the issue of air flow in buildings – the unpleasant stack effect. Another advantage is the reduction in dust and noise levels from the outdoor environment and the ability to separate incoming and outgoing visitors. 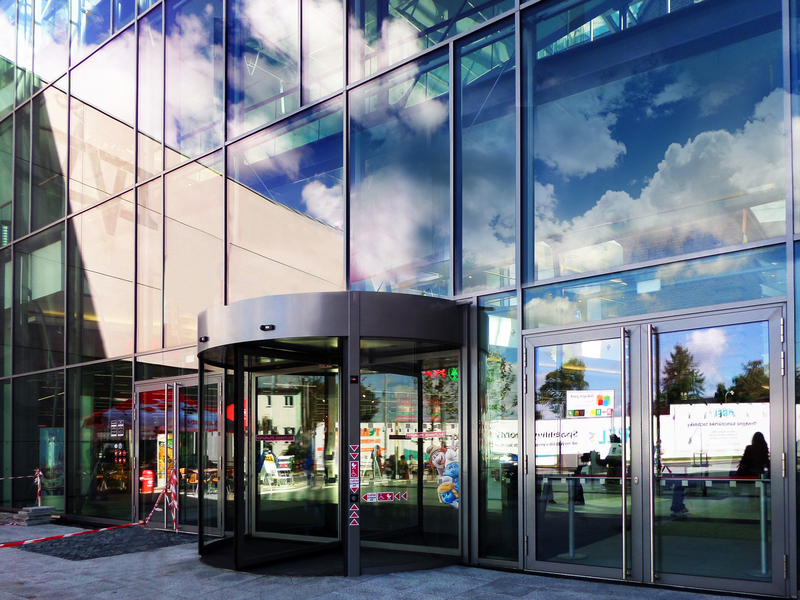 The placement of a revolving door in combination with a vertical air curtain located on the inner stanchion meets the most demanding criteria for thermal performance audits of buildings. 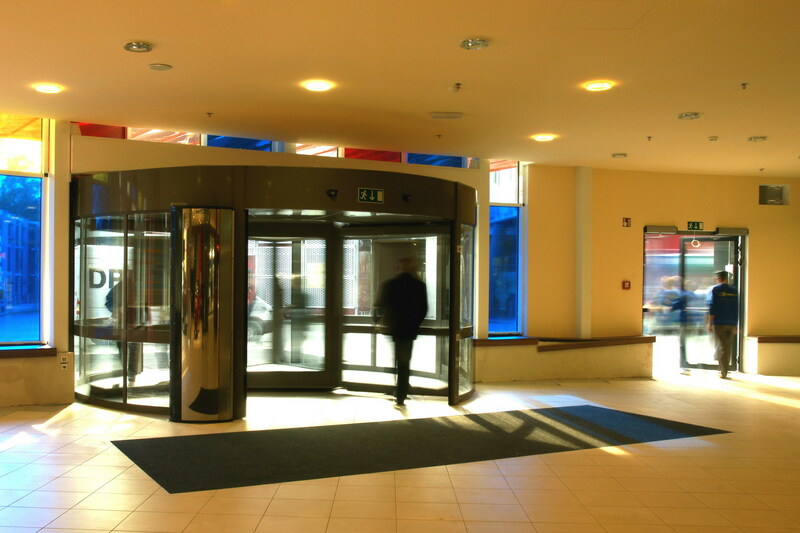 The Raccoon carousel-type revolving door is also the only revolving door in Europe that can automatically fold its wings. 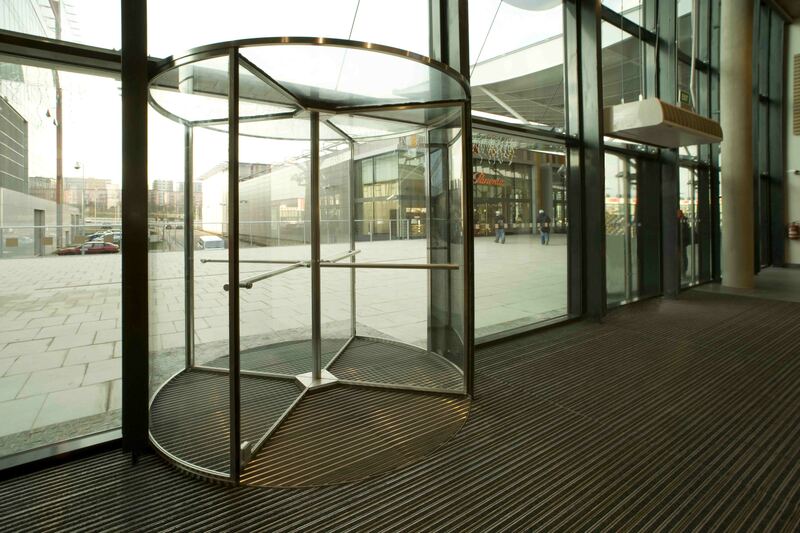 This feature enables people to escape safely from a building in an emergency situation, whilst allowing emergency services free access to the building to deal with the emergency. It also allows air to be sucked into the building to exhaust heat and smoke.